Yesterday, Catherine led a debate in Westminster Hall on behalf of the Petitions Committee regarding three Brexit-related e-petitions that had secured over 100,000 signatures. One of these petitions – calling for Article 50 to be revoked – is the most signed petition ever received on the House of Commons and Government petitions site, with over 6 million signatures. You can read a copy of Catherine’s speech below, the full debate here – or watch the debate online here. Ian Murray (Lab, Edinburgh South): My hon. Friend has been utterly fantastic on Brexit from start to finish. I am sure she will mention this later, but our constituents have been signing up to the big petition to revoke article 50, including 32% of my electorate in south Edinburgh. She will be as disappointed as I am that the Prime Minister and the Government, given that they are in such a mess, have simply dismissed those people and will not action anything they say. Catherine McKinnell: My hon. Friend raises an important point. That is why this debate is so important: to get these issues aired and make sure that we get answers from the Minister. I will make sure that he is clear on the questions and issues that we need answers for. As I said, we are discussing three petitions. Despite being overtaken by events, e-petition 243319, calling for the UK to leave the EU on 29 March 2019 come what may, secured 175,121 signatures as of 3.30 pm today. I make that point because the petitions are all still open. That figure undoubtedly reflects the great unhappiness ​and frustration felt by many people across the UK that we did not leave the European Union on Friday, as the Prime Minister repeatedly pledged that we would. Indeed, I know that many thousands signing these petitions, alongside a small minority of hon. Members, strongly advocate that the UK should have left the EU on Friday without a deal, and that we should now do so on 12 April, leaving us to trade on the much-heralded World Trade Organisation terms. Catherine McKinnell: My hon. Friend the Member for Bethnal Green and Bow (Rushanara Ali) was in the middle of her intervention when we were interrupted for that vote, so I am more than happy for her to finish her intervention. Rushanara Ali (Lab, Bethnal Green and Bow): I wanted to highlight the fact that, according to the Bank of England, warehouses are already running out of space—two-thirds are full. We do not have the capacity to cope with the kind of system that a no-deal Brexit would pose. If we have a no-deal Brexit, the worst-case scenario is an 8% reduction in our economy, with unemployment and inflation rising. Some 6 million people have signed the e-petition on revoking article 50, including 24,000 in my constituency. People are adamant that if we cannot settle this in the House in a way that protects their interests, jobs and livelihoods, then revocation should be on the table. I support my hon. Friend’s speech. Catherine McKinnell: My hon. Friend speaks from the experience that we have shared as members of the Treasury Committee, scrutinising in agonising and often frustrating and concerning detail the economic impact of the Brexit proposals, and in particular the potential ramifications of a no-deal Brexit. If anyone had told me when I was first elected to Parliament in 2010 that less than a decade later the Government of this country would be pursuing a policy that necessitates the stockpiling of body bags, I would have questioned my own sanity. Yet this is the appalling position that we now find ourselves in, because the Prime Minister has remained resolutely of the belief that refusing to rule out the prospect of a no-deal Brexit, thereby threatening to drive her own country off a cliff, somehow represents a bargaining chip when conducting an international negotiation. I, too, am angry. I am angry that we have spent three years not properly focusing on the myriad issues that we know desperately require our attention: climate change, ​the NHS, public transport, child poverty, food bank use, social care and universal credit. To provide just one example of how all-consuming this exercise in futility has become, it was reported over the weekend that two-thirds of staff at the Department for Environment, Food and Rural Affairs are now working on Brexit, instead of focusing on other crucial issues, such as tackling poor air quality or rising food poverty. Jo Swinson (Lib Dem, East Dunbartonshire): The hon. Lady is absolutely right that those are the other important issues that we should be directing our energy and focus on. Of course, Brexit will make them all more difficult to solve, because we will be poorer as a country and have less influence in the world. Does she think that that is one reason why 49 of the 65 polls taken on Brexit since the referendum have found a majority for remain? We have to go as far back as June 2017 to find the last poll that had more people supporting leave. Is it not entirely possible that the will of the people has changed? Catherine McKinnell: The hon. Lady makes some excellent and important points. It is good that they are now on the record. Anna McMorrin (Lab, Cardiff North): My hon. Friend is making an excellent speech on an important issue. Does she agree that, with the CBI and TUC calling this ​a national emergency, we need to take urgent action, decide on something and make sure that it goes to a public vote? Catherine McKinnell: My hon. Friend succinctly says what I will say in more words. I agree, and hon. Members are aware that I have campaigned for that outcome for the best part of a year. I have pressed for whatever deal the Prime Minister negotiated to be put back to the British public, given the enormity of the implications for our country’s future for decades to come. I have subsequently voted three times against the withdrawal agreement, because I simply cannot support something that I and the Government know will make constituents in Newcastle North and the wider North East poorer. Indeed, as the Government’s analysis shows, the North East will be hardest hit by any form of Brexit. Christine Jardine (Lib Dem, Edinburgh West): Will the hon. Lady give way? Marsha De Cordova (Lab, Battersea): Will my hon. Friend give way? Marsha De Cordova (Lab, Battersea): My hon. Friend is making an eloquent speech about the petitions and the need for us to remain part of the European Union. My constituents voted 78% remain, and thousands have signed petitions to revoke article 50 or call for a second referendum. Does she agree that if the Prime Minister can keep bringing her deal back to the House for us to vote it down, it is about time that she put her deal back to the public with the option to remain? Catherine McKinnell: It is a strong point. I have been clear about the potential ramifications of the Prime Minister’s Brexit deal and my concerns about exiting with no deal, but I am prepared to accept that many people in my constituency voted to leave and want to leave the European Union. That is why, if this Brexit deal is the best deal available—the only deal available, as the Prime Minister and the EU have told us—the Government should have the courage of their convictions and put it back to the people for them to have the final say. Ged Killen (Lab, Rutherglen and Hamilton West): My hon. Friend is making an excellent point about people who still want to leave the European Union. Is it not the case that, given all the water that has gone under the bridge, if we do not put it back to the people, the deadlock that we in Parliament are trapped in will continue through the next stage of the negotiations? It will never be over unless we give it democratic legitimacy. Even if people want to leave, at least they can confirm it. Catherine McKinnell: Absolutely. So much has become evident since the referendum vote in 2016 and we all, including the public, those in Parliament and those in the European Union, know more about what Brexit means. If the Prime Minister is confident that her deal is the best deal available for the country, we must surely go back to the public to ask if it is what they want for their families and communities, and for our country. James Gray (in the Chair) Her speech. Andrea Jenkyns (Con, Morley and Outwood): Hearing her speech makes me believe that she is trying to give the public the option of Brexit in name only, with the Prime Minister’s deal, or no Brexit. Is that fair to the 17.4 million people who voted to leave? She says that she is prepared to accept that her constituency voted to leave, but is she prepared to accept that the country overall voted to leave? Catherine McKinnell: Absolutely. We had a referendum in 2016 that put the basic question, “Do you want to leave the European Union?”, and 17.4 million people voted to leave. I have said clearly that I respect all the different reasons on which those people based their vote to leave. I have spoken to many people who have given many different reasons why they wanted to leave the European Union and why they voted in that way. Andy Slaughter (Lab, Hammersmith): My hon. Friend mentions what happened last Friday afternoon. It is extraordinary that Parliament was closed down in the middle of the afternoon and our staff were sent home. I was with a party of schoolchildren who, ironically, were the chief debaters who had won a competition in the London boroughs, and were looking forward to their tour of Parliament. They were mainly black, Asian, and minority ethnic youngsters, including identifiably Muslim and Jewish children, who were then asked to leave the estate and filter out into the crowd. Is it not extraordinary that we can be brought to such lengths by a few extremists and thugs? Catherine McKinnell: Yes; many hon. Members were disturbed by the scenes they witnessed on Friday directly and on the news. As many have made clear, those people ​do not reflect the people who voted leave, but they professed to be the spokespeople for the leave campaign on the streets of London. Heidi Allen (Ind, South Cambridgeshire): People talk about the divisiveness of a second referendum, which seems to be the biggest reason not to have one. To follow on from the hon. Lady’s point, however, I would argue that nothing could be more healing than involving the entire country in the decision about what to do next. Everybody’s voice is equal—nobody loses and nobody wins—because that is democracy. Fortunately, we do not live in a country where some voices are more important or more valid than others. Catherine McKinnell: The hon. Lady makes the point well. There are people who think that the radical approach of democratically asking the public what they think would unleash an almighty backlash and all sorts of dangerous extremism, but I say to them that such extremism clearly exists already. We saw it on the streets of London on Friday and I am certainly not prepared to roll over and appease it. Dr Julian Lewis (Con, New Forest East): That is indeed an extremely impressive total of petition signatories. Therefore, would the hon. Member like to suggest that instead of having held the referendum in the first place, ​it would have been sufficient to put an e-petition in and get that particular fraction of the population voting for it, in order to set aside a democratic vote by a much larger number of people? Andy Slaughter (Lab, Hammersmith): My hon. Friend is being very generous in giving way, but that was a bit of sophistry that we have just heard. Six million people—an extraordinary number—signed this petition as against some of the leave petitions, just as there was a 1 million-person march as opposed to the pathetic little leave march, showing a change in the zeitgeist, if I am allowed to use European words. Are we not seeing the people speaking up at last and saying, “We are not going to allow some of the people in the House of Commons to ruin the country, economically and politically, for the future”? Catherine McKinnell: My hon. Friend has put that very well. Chris Leslie (Ind, Nottingham East): On this point about the number of signatures—in my constituency, there were more than 9,500 signatures—I understand that General Data Protection Regulation rules mean that I cannot necessarily see who has signed that particular petition. Normally, however, in a petition we get a sense of who has signed. Is it possible that the House authorities would at least be able to email back those people who have signed the petition, to give them some feedback about what has happened to it in Parliament, because, like many others, I would like them to know that, yes, I am prepared to support revoke and remain, rather than have us crash out of the EU? Catherine McKinnell: I am sure that is now on the record and as the Petitions Committee, which is a formal cross-party Committee of the House that processes the petitions tabled by members of the public which reach the threshold for a petition to be debated, it will obviously notify the people who have signed it, to tell them that the issue has been tabled for debate or that there is a response from the Government. Dr Julian Lewis (Con, New Forest East): The hon. Lady is being terribly courteous and I really appreciate it. Let us just try this new form of democracy a bit more. Let us suppose that her party—the Labour party—gets its wish and there is a general election. Guess what? The Labour party wins and the right hon. Member for Islington North (Jeremy Corbyn) becomes Prime Minister. Then, some of us who did not like the result set up a petition and get 6 million people to say, “No, we ought to revoke that result and do it again”. Would she be satisfied with that? Catherine McKinnell: May I clarify matters for the right hon. Gentleman, because he does not seem to understand the nature of a petition, which is a very long-established process in Parliament and a way for our constituents to express their view on matters, and for many years—probably since it began—Parliament has processed petitions and tabled them on behalf of MPs’ constituents? The nature of our modern democracy is that the petitions process has gone online and it was indeed the former Prime Minister who created the Government’s online petitions system in 2010. Since then, it has grown in popularity and use. Christine Jardine (Lib Dem, Edinburgh West): I thank the hon. Lady for giving way and I will just reinforce that point. As someone who was elected here to represent my constituents, I find it extremely useful in the difficult decision-making process that we are going through to have the figures to show that more than 15,000 people in my constituency signed this petition and that they want us to reconsider matters, not blindly go off a cliff and crash out of Europe. It behoves us well to pay attention to what our constituents are telling us. Catherine McKinnell: Indeed, because what this petition —combined with the million-plus people who gave up their Saturday to march here on the streets of London just a week ago—demonstrates is that there is a very large number of people in this country who are extremely concerned about Brexit, the Government’s approach to this process and the implications of all this for the future of our country. Wera Hobhouse (Lib Dem, Bath): The hon. Lady is generous in giving way. I come back to the suggestion that after each election somebody could launch a petition to reverse the result. The extraordinary thing about the 2016 referendum is that the Government, and many Members in this House, insist that the result of that referendum can never be changed, whereas we have elections every four or five years, so decisions can be reversed. However, in this case it seems that we can never, ever change our mind about the referendum in 2016. Catherine McKinnell: That is an important point, which is now on the record. Andrea Jenkyns (Con, Morley and Outwood): I thank the hon. Lady for giving way again. To raise a contrary point to the one just made by the hon. Member for Bath (Wera Hobhouse), does the hon. Lady agree that this petition and those in this place who support it actually have only one goal, which is to overturn the referendum result? Catherine McKinnell: No, I completely disagree with that. I have already set out very clearly my views and my concerns, which I think are shared by a huge number of people. However, I absolutely share the concerns that have been expressed by those calling for a public vote on the outcome of the Brexit negotiations, because I did not come into politics to make my constituents poorer and I did not get elected to this place to drive my country and its economy off a cliff. John Redwood (Con, Wokingham): Perhaps, then, the hon. Lady would like to tell us why the remain Bank of England/Treasury forecast for what would happen in the first two years after a leave vote—it was said that there would be a recession, big job losses, an investment collapse, a share market collapse and a housebuilding problem, and the reverse of all those things happened, with jobs up and no recession, and we now have better growth than Germany or Italy—was so wrong and why we should believe her pessimistic forecast for 15 years’ time, when they could not get the first two years right. Catherine McKinnell: Many of the predictions that were made—for example, that we would see a stall in investment or the economy being affected—have happened, and even when there is an increase in jobs, which the Government often like to talk about, we see more and more people using food banks and struggling to make ends meet. So, if anyone suggests that we are somehow better off now than we were in 2016, they are wrong. All the projections show that we will be only more greatly affected and that investment and economic growth will be further deflated. The right hon. Member for Wokingham (John Redwood) makes his point, and he makes it regularly. I recognise that the economy was not the driving factor for many people when they voted in 2016, nor was it their determination that we must leave the EU as soon as possible at whatever cost. All the parliamentary sovereignty in the world will not make up for the impact of rising unemployment, reduced living standards and lost opportunities, not least in a region such as the North East, which has been abandoned to the economic scrapheap too many times. Rushanara Ali (Lab, Bethnal Green and Bow): Does my hon. Friend agree that since this whole affair began there has been no parliamentary sovereignty? It has been sovereignty for the Prime Minister and her Cabinet, trying to ram through a deal that has been rejected three times. It has been an obsession of the Tory party, and a division within that party. The whole country and its future are being roped into the collective breakdown that the Conservative party is having. The right hon. Member for Wokingham (John Redwood) will know, from his own party’s history and his part in it, about the Tory party’s tearing itself apart for the last three decades. And it continues, but this time it is destroying our constituents’ livelihoods. Anna McMorrin (Lab, Cardiff North): As we have heard, the Electoral Commission found Vote Leave and Leave.EU guilty of corrupt activities. Does my hon. Friend agree that until the National Crime Agency has done its investigation we cannot take the result of that vote as clear? 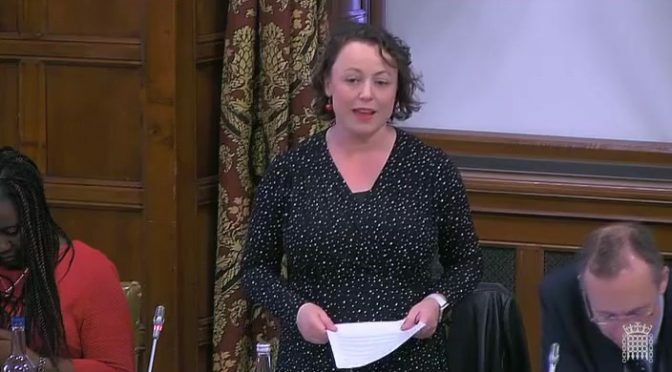 Catherine McKinnell: Those concerns are being expressed by many members of the public as they watch the reality of the 2016 referendum campaign and vote unravel. As we get closer and closer to 12 April, I have been making it clear to my constituents that I am prepared to support the revocation of article 50 if necessary, to prevent our country from leaving the EU without a deal. Dr Julian Lewis (Con, New Forest East): There is one slight difference between the hon. Lady’s examples and what happened in 2016, when the MPs, the Government and the Opposition—everyone—agreed that they would take the view of the electorate directly and obey the verdict that they gave them. That did not apply in the scenario she describes relating to Edmund Burke, great constitutionalist though he was. Catherine McKinnell: The right hon. Gentleman seems a bit stuck in the past. What we are talking about today is what we directly face. We could rerun the 2016 referendum campaign. We can debate the rights and wrongs, and the arguments for and against, over and over. I did not vote for the referendum or to invoke article 50, for the very reason that I could see us setting a clock ticking on a negotiation without an agreed strategy or plan. Many Members did not vote to invoke article 50, and many Members who are in the House now were not even elected at the time of the referendum. We had a general election subsequently, and that general election returned a hung Parliament, so we are where we are. The petition considers the immediate possibility that is staring us in the face—a no-deal exit from the EU, which is the legal default position if nothing changes today, or this week, to remove that possibility for 12 April. Catherine McKinnell: I think the Minister wants me to give way. Catherine McKinnell: I was hoping the right hon. Gentleman would make a speech. Dr Julian Lewis (Con, New Forest East): I am sorry; I thought the hon. Lady wanted an answer now. I think there are three possibilities: the Government’s deal, leaving on World Trade Organisation terms and revoking the result of the referendum. I, together with 158 of my colleagues, which is more than half the parliamentary Conservative party, voted in the multiple options we were given about a week ago that we should leave on WTO terms, and I think that would be the right solution. Catherine McKinnell: We can agree to disagree on that. Chris Heaton-Harris (Parliamentary Under-Secretary for Exiting the EU): I will congratulate the hon. Lady properly later. She mentioned that things had moved on and that there had been a general election. Will she remind the House what the Labour party’s position was, in that election, on respecting the result of the referendum? Catherine McKinnell: What is so difficult about the debate is that it has wedded itself to events in the past, rather than looking at the reality right in front of us. The time-limited article 50 process was triggered without any plan or agreed strategy for where we wanted to end up—I voted against it at the time for that very reason—and months of valuable negotiating time were wasted on a general election that resulted only in a hung Parliament. After that election, there was a complete failure to listen and to reach out to or engage with MPs—either by party, geographically or according to their views on Brexit—to build that much-needed consensus, with every decision taken by the Prime Minister in her narrow party interest, rather than with the greater good of the country in mind. Yet more time was wasted by repeatedly postponing, or simply ignoring, meaningful votes on the agreement, even though it was clear some four months ago that it would not command Parliament’s support. Craig Mackinlay (Con, South Thanet): Has this petition not shown clearly what the People’s Vote is about, and made its veil drop? One could argue that the People’s Vote has no grand ambitions such as, “Let’s have democracy,” because this has nothing to do with another vote; it is about revocation. Will the hon. Lady now be honest and say that what she and others have been supporting through the people’s vote is revocation, not some grand democratic rerun of a vote? 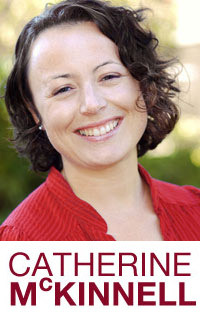 Catherine McKinnell: I am not sure that the hon. Gentleman has been here for the full debate. [Hon. Members: “He hasn’t.”] He has not, so he was not here when I set out the three petitions that we are debating. This one is about revoking article 50; the previous petition was in relation to a second referendum on the EU debate. I take great exception to his suggesting that, in some way, I am being dishonest in what I am saying. James Gray (in the Chair): No, the hon. Gentleman did not. James Gray (in the Chair): I think he did not. However, Hansard will tell. But I am sure that he was not intending to do so. Catherine McKinnell: Thank you, Mr Gray. The hon. Member for South Thanet (Craig Mackinlay) did suggest that I should be honest. I have been honest, and I am being honest. This petition calls for the option of a revocation of article 50 to avoid us crashing out of the EU without a deal. The campaign that I support, which ​is for the Brexit deal that Parliament arrives at to be put back to the people in a public vote, is obviously connected to that, but is an entirely different proposition. I hope that has clarified it for the hon. Gentleman. Instead of more dithering and delay, it is incumbent on us to urgently find ways to put a stop to this crisis. I believe that the only democratic way to move this process on for the country is one that would require an act of true national leadership by the Prime Minister: she must now agree to put her withdrawal agreement back to the public for a final confirmatory vote. If she is not prepared to do that, she—or we—must step back from the precipice and revoke article 50 in the short-term, medium-term and long-term interests of our still-great nation. It is clear that, however this Brexit saga ends, things have to change. As a country, we have an enormous amount of work and listening to do. We must rebuild to put our economy and our society back together and give everybody a stake in, and hope for, the future. The sooner we can all get on with that, the better.